The heat is on and Summer is in full swing in Mumbai, things started to get really uncomfortable in March and I have reached a point at which nothing I do to keep my home cool (short of blasting the AC) works. I don't know about you, but it gets me everytime, and I just can believe that there was a thing such as a pleasant weather a few weeks ago, if not almost cold in the mornings if we go as far as January. That's how quick the weather changes in Mumbai and that usually leaves us all dead beat tired as our bodies try to adjust to the sudden changes in climate. Soon enough, we will start stewing in our own sweat as the humidity levels rise. 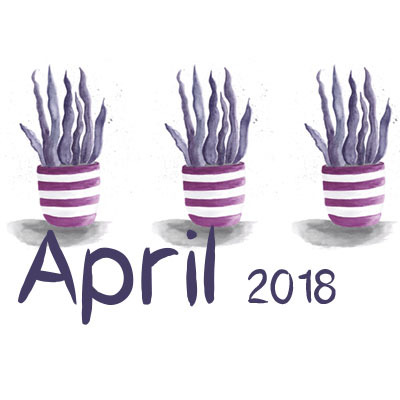 If, you have been following this blog regularly, you know I crib every year about the weather around that time, so I'll cut that rambling short and announce that my April calendar page is up for download instead. As you may or may not know, this year I chose to illustrate each month with some of my existing artwork and let you know where to buy it on other products. 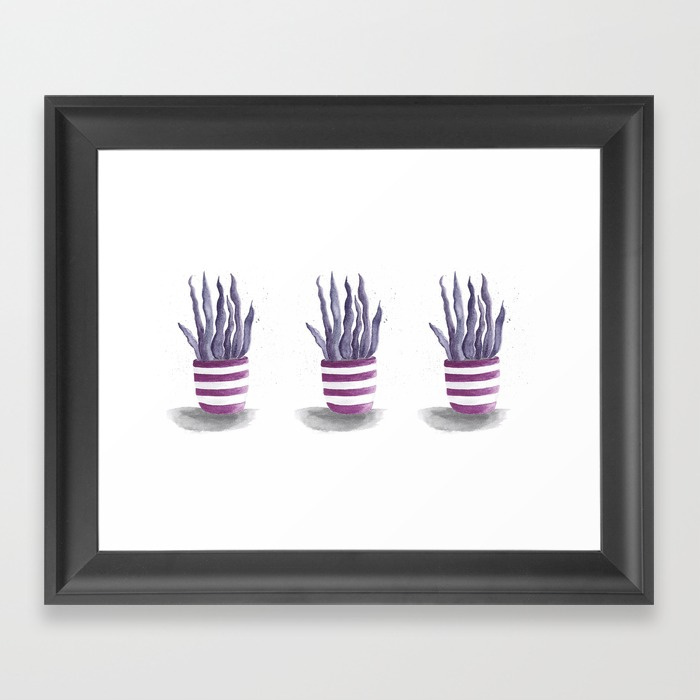 Like in the framed art print above which you can find at Society6. If you live in India, you can also find this art print at Paintcollar both as a poster and a canvas print. 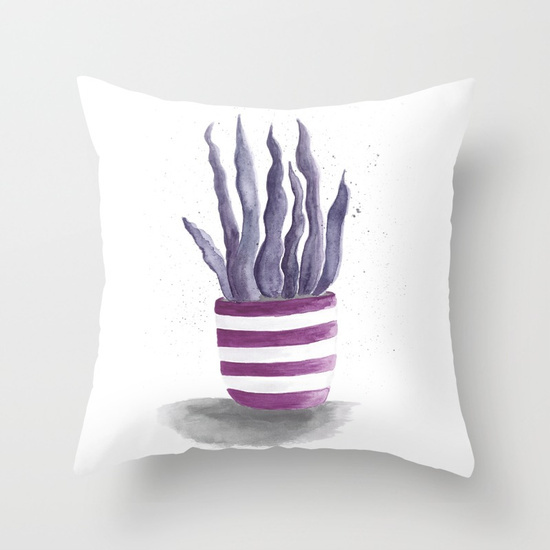 It is not to say it is not available on other products, it's just that when the width didn't allow it, I stuck to just a single succulent pot instead of 3, like in this Society6 throw pillow above. A painting I also offer on sale in all of my shops by the way. 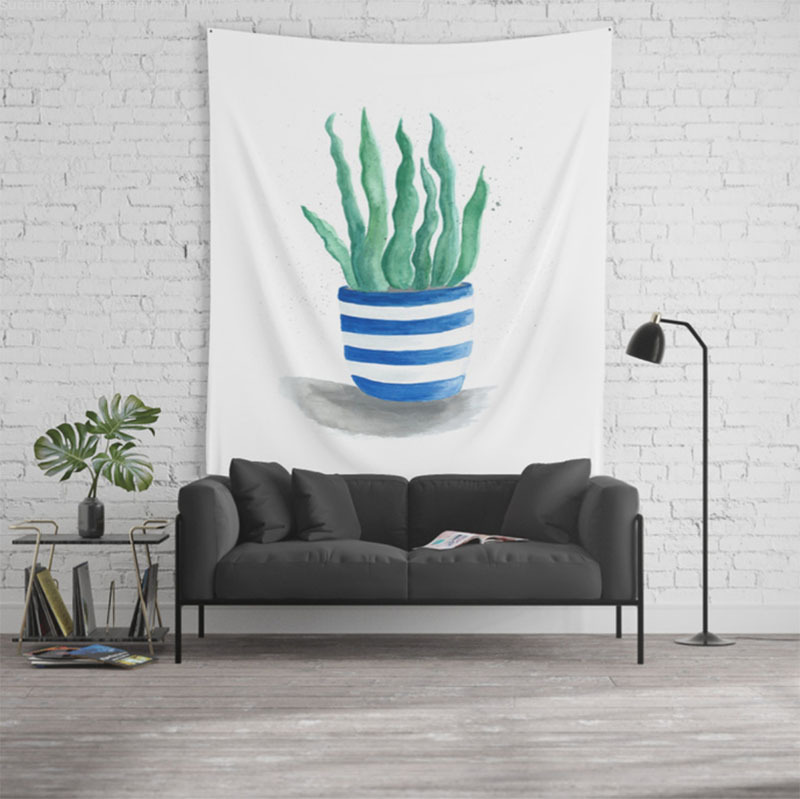 You could totally get it as a large wall tapestry at Society6 for example. Or as a cute rug, still at Society6. 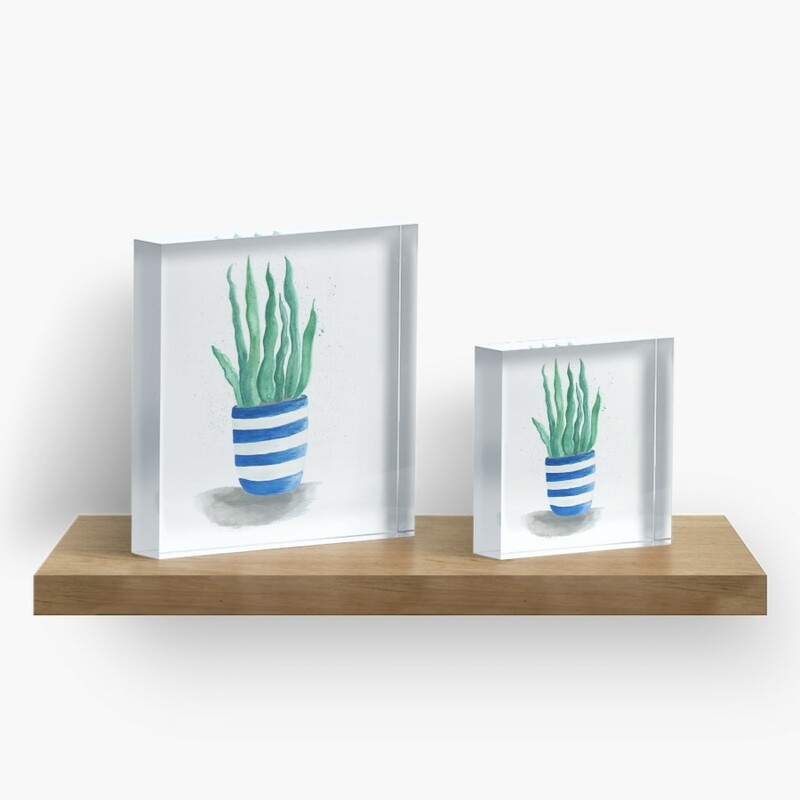 At Redbubble, it's even available as an Acrylic Block you can display on your shelves. Both Society6 and Redbubble will ship worldwide, while Paintcollar ships within India. I placed an order for a carry-all pouch on Society6 earlier this week as there was a 25% discount on it. The shipping wasn't free this time, but at 5$ it still made it viable at such a discount. I was eager to know how fast things ship to India. I'll let you know once I receive it, and always remember to check on my Facebook page, or Twitter to be kept in the loop about Society6 promotions, I keep you guys informed about them on those two handles regularly. This year summer arrived in the middle of february. February and march were horribly hot. Just came back from jaipur which was hotter than delhi. Four days holidays well utilized. 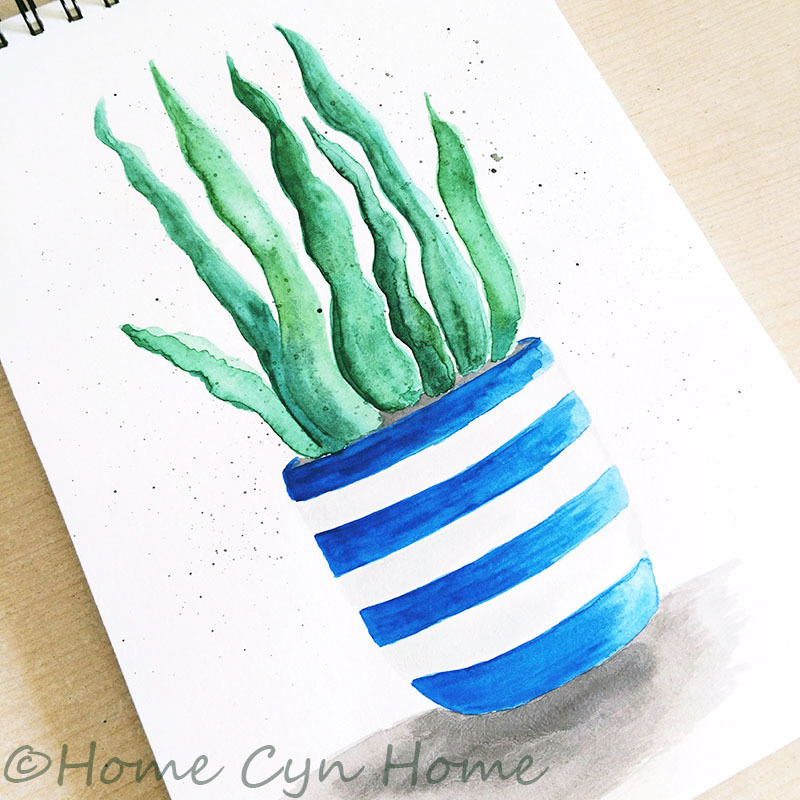 The design looks like cactus in a pot perhapa to signify the harshness of summers. Indeed, Bengaluru is also getting warmer steadily. A few days back, we had heavy rains in the evening, which brought the mercury a bit down. I remember those April-May showers, they made waiting for the monsoon more bearable. In Mumbai we don't see any rain until June, pretty much when the monsoon hits us. It is still bearable right now though barely, by the end of this month it will be pretty suffocating.